Today is the happiest day of my life! Not because I won a prize or receiving some awards or whatever!!!!! It's all because I'm blessed that I finally found.......(shout out!) my long lost pen friend. AAAAAHHHHHHHHH...........I am totally thrill when I saw her mail after coming back from my hubby's workshop. Suddenly my eyes turned red ....I'm quite an emotional person. This is just unbelievable...... unbelievable! There's so many things to catch up with her after so long......if not mistaken it's about 24 years. This is most probably a perfect cake for a perfect day! - cook ingredients (A) over low heat until sugar dissolved. - dissolve gelatine into water then stir into mixture (A). - finally, fold in whipped cream and mix to combine. - spread mixture to biscuit base pan and leave chilled to set. - then decorate the top with grated chocolates. Oh dear, this is just so delicious! Such refreshing flavour for this heaty season. Somehow, miracles did happened! I believe in faith and so is hard work & courage. *Marie, I'm looking forward catching up with you what we have missed out! It's like filling in the blank in our lifetime stories. The greatest moment ever. With lots of love, ((hug)) & kisses! oh ,kristy,you make me cry with this touching story about friendship!lucky you!your cake is so refreshing,adorable colour! How sweet!! So glad you found each other again and what a way to celebrate! Sweet sweet! I used to have pen friends though it might sound like it happened ages ago. I can completely feel the joy you had when you got that mail! Beautiful cake to go along with this happy day! How cute and girlie! This cake deserves to celebrate the special unification. Enjoy!! Pinky chocolate atop makes the mousse cake even more enjoyable! Nice to get in touch again with your pen friend! Yay! That is so cool Kristy...you're making me cry too! Isn't it amazing how things work out sometime. And this thing called the internet....how it can bring people so close together! What a beautiful way to celebrate! Wahoo! To bad we can't taste your food through the computer....will you invent that for us? hehehe! Very happy that you have found you friend. How lovely and miraculous! You get pink chocolates? I am curious about the grated chocolate top. Let me know what it is. A fabulous mousse cake and this certainly is getting bookmarked! Kristy, the cake looks so auspicious, like some wedding cakes! How can you get back your long lost penpal after so many years? Really incredible! Thank you so very much and am dancing with joy right now. I just received her 2nd mail. She told she was actually looking for me too over the years! This is truly amazing. Sounds like we are both really connected to each other. I hope miracles happen to all of you too! Have a wonderful day. Hi Kristy, congrats on finding your long lost pen frd! the cake looks so eye catching and beautiful, pink bcome my favourite color after I gave birth to my gal so I like anything in pink :). The cake sure is yummy, will bookmark this, thanks for sharing! What wonderful news :) may you always be this happy daahling :D. Stunning cake, such a fantastic colour :D.
How wonderful to find an old friend, Kristy! I'm so pleased for you. 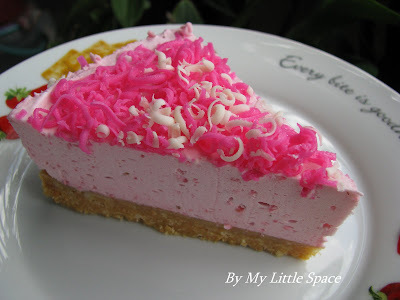 And your strawberry mousse pie looks divine..the color is beautiful. I'm thrilled for you Kristy! I remember you posting the story. That is the best news! And wow does this mousse cake look delicious! And it's so pretty. 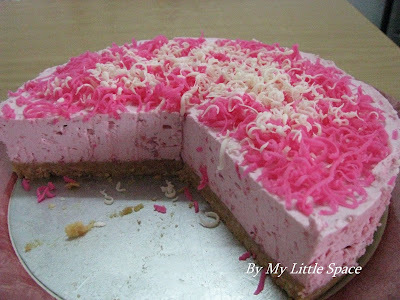 This is something I will definitely make...light and delicious strawberry mousse cake ...thanks! I had a similar thing happen to me as well. She is not a pen friend but an old best friend! Hey Kristy, hope you are having fun with your friend! 24 years is a very long time! such an emotional moment...And that gorgeous cake is perfect for the occasion, and I am sure she loved it! Enjoy the friendship and the cake! I hope I could make each reply personally but very limited time for me to do so. So, just ended up making a quick one. Hope you don't mind. Thanks alot for visiting and spending your time here with me. I enjoy every moment of it. Hope you are too. Remember, what 'Forest Gump' said "Life is like a box of chocolate! You'll never know what you'll get!". This is so true. Hope you're all having a wonderful day and the best time of your life everyday! It is so wonderful for you to reconnect with your long lost friend! That is possibly the pinkest cake I have ever seen! It's so great that you got back in touch with your pen pal after so long! What a happy, yummy looking cake to celebrate such great news! Thankfully we all at some time or other experience this exhilerating moments. I'm glad for you to experience such a joyful time. Kristy, glad that you have found your long lost friend! LOL! It's a fair share of happiness, cause you are sharing another wonderful recipe with us, moreover it's another oven free recipe!!! Hurray! I'm so happy for you that you found your long lost friend. Your strawberry cake looks wonderfully tasty. Perfect for the holiday weekend. Wow... it looks so cute and girly, Must taste delicious. Your discovery is worth its weight in gold - rekindling a friendship. And that delectable mousse cake is the best way to celebrate! Great to hear you were reunited with your friend...That looks so delicious. I know it tastes fantastic...Strawberries are always a favorite of mine...It is very PINK! wow whata lovely color and soft cake sure taste heaven..
nice and delicious colourful cake! It's always nice to meet an old friend:) Your cake is so gorgeous with it's pink and white chocolate shavings! what a wonderful reason to celebrate!glad you found your old friend and glad you posted that refreshingly beautiful recipe! This is a so "lady-like" looking cake. :) Pinky cake, so pretty! Oh, I've just revamped Luxury Indulgence. Pop over when u've time & let me noe ur views. Have a good weekend, my friend! Wow, strawberry mousse sounds fantastic! So creamy and delicious, I bet. Congrats on finding your friend:) The cake looks fantastic! This looks most amazing - wow! Glad you got such good news. Kristy friends are precious gift of life, I am so happy to know about your reunion! Today you share a touching story and a lovely heart warming cake! When happiness overflow then such colorful creations are made! Great! That's really soooo sweet! I'm so happy for you :D Your cake is so beautiful and a show of love. It reflects your sweetness and also your love for others. You are just one lovely, amazing lady, Kristy! Thank you for sharing this story. It is beautiful and so is that cake. It is so girly and sweet and I want it, now.